Despite the strategic level of the game, there are operational and even tactical nuances, as players must decide when and how to commit their carrier forces, land-based air, and even their intelligence assets. To a degree, the Japanese player is racing against the clock. The quality of his pilots degrades over time, and starting in 1943, he also loses the strategic initiative as he becomes the second player. The US Player is also fighting the clock, as he cannot sit back and take a relaxed approach to defeating Japan. If he doesn´t win by 1945, he doesn´t win at all. Tension build as both sides race toward decisive carrier battles and seizure of key geographical objectives. The card-based combat/build system is a different take on the "normal" event/operations points driven systems. Separate card decks are provided for the U.S. and Japanese player. Each year, the players receive that year´s cards for free…but must use build points to repurchase older cards. This will cause the player a few agonizing moments, as he typically cannot afford to re-buy every card he needs (or thinks he needs). Players must also decide which aspect of cards to use – many have multiple but exclusive uses (such as, "Do A or do B") and these uses sometimes give very different results based on operational or strategic needs at the time. To help ensure a tense and dynamic game, the system forces players to make many choices and decisions throughout play. As a bonus for solo players, Pacific Tide features a solitaire assistant – commonly known as a "bot" – which gives guidance to the player for either side during solitaire play. The assistant acts differently based on the "personality" it´s been given...aggressive, defensive, or balanced. All game cards have a rating which the assistants will prioritize differently for play. 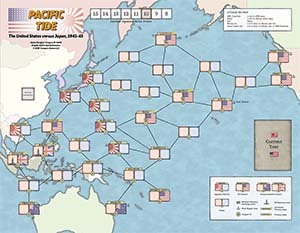 While extremely competitive as a two-player game, Pacific Tide can be enjoyed again and again in solitaire play format with its unique, “personality” driven bot system.